The World No.17, who lost their opening game of the tournament 2-0 to USA at the Estadio Mineirão in Belo Horizonte on Thursday, rallied in superb fashion today to defeat Colombia 1-0 at the same venue. It was the team’s second win at an Olympic Games, four years after they defeated Cameroon 3-1 in Coventry at London 2012, and much deserved as they dominated possession and territory throughout the match. Striker Amber Hearn opened the scoring in the 31st minute to cap off a dominant period of attacking play. Hannah Wilkinson was the main offensive threat in the opening half an hour but it was New Zealand’s most prolific scorer who found the back of the net for the decisive goal. The 31-year-old from Auckland, who plays her club football for USV Jena in Germany, collected a Betsy Hassett cross inside the box and composed herself before slotting home. 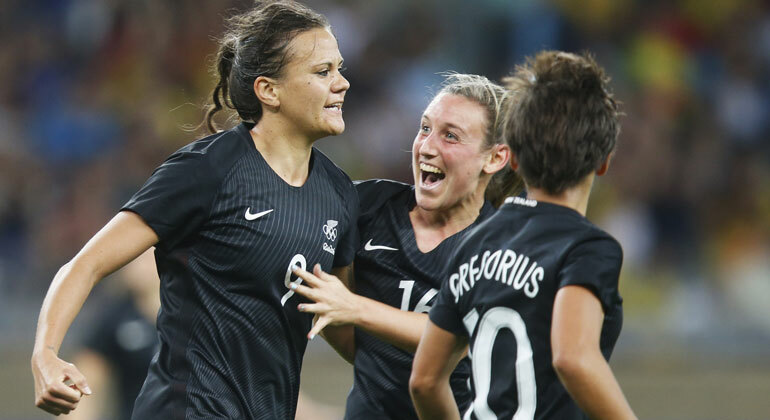 It was Hearn’s 52nd goal for New Zealand – to extend her lead at the top of the all-time scorers’ list for both male and female players – and was the perfect tonic to settle the Kiwi nerves. New Zealand kept on coming and could have doubled their advantage with Annalie Longo showing superb skill to direct a tough chance on goal shortly after. While the first half was all New Zealand, the Colombians came back into the match in resurgent fashion in the second spell. Hearn went close to doubling New Zealand’s lead with an audacious shot from outside the box but, aside from that, the South Americans held the ball for lengthy periods and had their best chance of the night when a free kick from wide on the right hit the crossbar before being cleared. New Zealand soon reasserted their dominance though and their superior fitness levels – along with the timely introductions of Katie Bowen for Sarah Gregorius and Rosie White for Wilkinson – saw the Kiwis back down the right end of the pitch and threatening. Colombia posed danger on a number of occasions but good defending saw New Zealand hold on for the all-important win. They had to come through a nervy final few moments though when captain Abby Erceg was harshly sent off in the 88th minute and goalkeeper Erin Nayler had to pull off a great save to keep the scores level from the resulting free kick. New Zealand, who reached the quarter-finals of the London Olympic Games four years ago, now have a great chance of qualifying for the final eight once again if they can beat or draw with France in Salvador. France, buoyed by their opening 4-0 victory over Colombia, were defeated by the USA 1-0 earlier today which means the World No. 1 and defending champions are likely to top the group. A win for New Zealand against the World No. 3 would assure the Kiwis a spot in the quarters in Sao Paulo and a draw should also be enough. Today’s win continued New Zealand’s unbeaten record against Colombia. They had met twice before, both times at the Matchworld Cup in Switzerland. They triumphed 1-0 in 2011 when Hassett scored the winner and 2-1 in 2012 when Hearn and Rebecca Smith got on the scoresheet. Tony Readings’ side will travel to Salvador where they will meet France at the Fonte Nova Arena on Tuesday night.